“AI” trolleys are custom-made and cover a wide range of top-quality solutions to meet the needs of butcheries, delicateness, canteens and restaurants. Our range also includes specific trolleys for cold cuts maturing and tray trolleys. TROLLEYS TO CARRY QUARTERS: trolleys meant to carry quarters from the unloading area to the cold room. They can also be used as an alternative to meat framings and guideway rail systems for meat storage in butcheries with small cold rooms. They are available both with sliding hooks and fixed hooks. TROLLEYS WITH SHELVES AND HANGING BARS: light and stable at the same time, such trolleys can be easily moved also when they are fully loaded. They are made to measure and with the requested number of shelves. They can be also equipped with hanging bars for meat and salami. 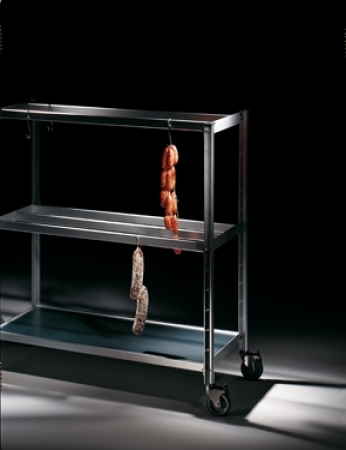 TROLLEYS FOR COLD CUTS MATURING: the ideal bespoke solution for cold rooms. The anodised aluminium alloy frame combines robustness with stability and high manoeuvrability. TROLLEY TO CARRY TRAYS: initially conceived to be used in butcheries, they are now widely used in restaurants, self-services, hotels, canteens an communities.